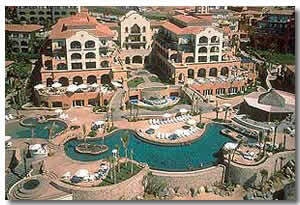 The Sheraton Hotel in Cabo San Lucas is part of the Sheraton Hacienda Del Mar Resort & Spa. A resort that hosts The Cabo Del Sol golf courses. This resort is about 10 km from downtown Cabo. So it's perfect for a quieter, more relaxed vacation. You have two championship golf courses at the Sheraton Hacienda resort to practice your driving and putting skills on. If you are a big golf fanatic you have the other four Cabo San Lucas golf courses to play a round on. These are all within 16 km of the resorta and in the Los Cabos Corridor area. You have five restaurants where you can enjoy your food and drink. Two of these have dress codes so you do have to make an effort. Long pants/trousers and sleeved shirts are required at the Grill & Restaurant de Cortéz and Pitahayas restaurant. There is something for everyone at these restaurants. The menus vary from the taste-of-home burgers to Duck-lamb satay. Eating at the Sheraton Hotel in Cabo San Lucas can rack you up a large bill. Eating away from the resort will definitely save you some dollars. You probably get the same amount of food and drink at a restaurant in downtown Cabo for half the price. You're spoilt for choice with the swimming pools at the Sheraton Hotel, you have four to choose from. All of them are heated so it's a comfortable dip any time of the year. Some hotels that don't have heated swimming pools get a bit cold between November and February. Three of the pools are along the beach front which are all close together. You have a toddlers pool on one of them which gives very small children a chance to have a dip on their Cabo San Lucas vacation. There's one other pool over on the east side of the resort. This one has a swim up bar for you, and is a little more relaxing compared to the other three pools. You are at an advantage if you rent a car for your stay to drive around Los Cabos. The cab fares soon mount up if you go out of the resort a lot into downtown Cabo San Lucas. There's a bus service, but it is a bit of a walk before you reach it. TheSheraton Hotel in Cabo San Lucas is a perfect for anyone wanting a more relaxed vacation. A few miles away from downtown Cabo you will be away from all the hustle and bustle of all the partygoers. With a children's pool and club you can relax with the whole family, and there are plenty of activities to keep them occupied for their vacation in Cabo San Lucas.